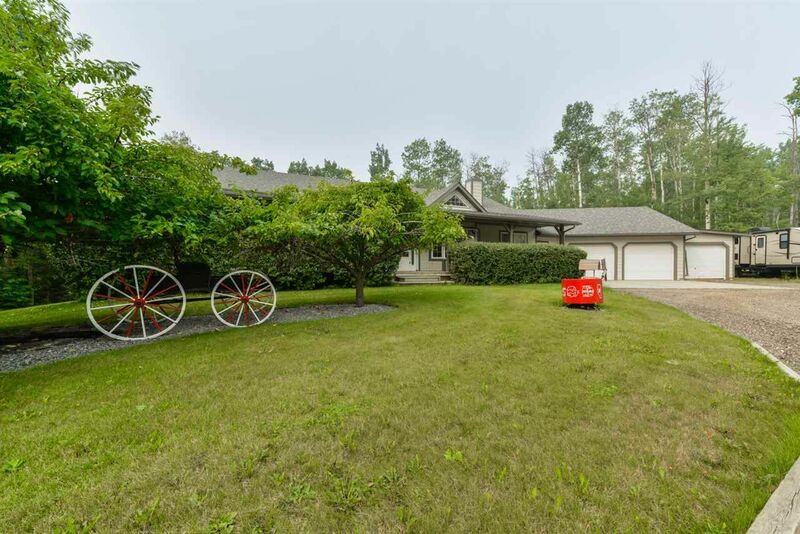 Your very own cabin in the woods with all the bells & whistles, and less than 10 minutes to Spruce Grove on PAVED roads! Nearly $100k was spent upgrading this spectacular FULLY-FINISHED bungalow to include: new powered gate at the entrance to the property, new stone wall & built-in mantle around the gas fireplace in the living room, new GRANITE countertops, backsplash & black/stainless-steel appliances in the kitchen, new carpet & hand-scraped laminate flooring, and a new hot-water tank just to name a few. The exterior includes all new siding, a new 9’ overhead door on the 37'x25' HEATED shop, new landscaping with firepit & hot tub, new pressure tank for the well, and new recycled asphalt for the driveway. With rustic wood tones throughout, a fabulous floor plan, and more privacy that you could ever dream, this 4.2 acre property is SPECTACULAR!